On Sunday, the Stuff website carried a story about a particular brand of essential oils that may as well have been marked ‘advertorial’. 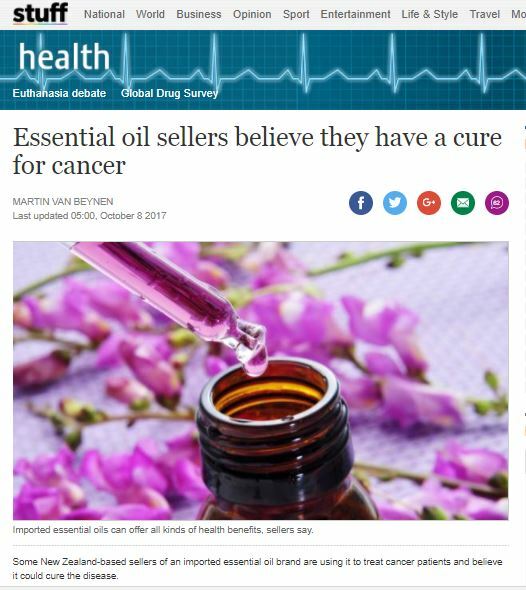 This is because most of the article comprises positive commentary from those involved in selling the products – you have to scroll well down the screen to find a photo and brief comment from the Medical Director of the Cancer Society of New Zealand, and other than that, any remotely skeptical content comes at the end of the article. Now, while the US-based company concerned, DoTERRA, doesn’t make any specific health claimsA, the same can’t be said for those quoted in the stuff article. It’s claimed or implied that the oils are effective against asthma, chronic fatigue, auto-immune disease, colitis, Crohn’s disease, bee-stings, depression – and cancer. Scott said she wasn’t allowed to say Copaiba oil was a potential cancer cure but “it absolutely is. It needs studying because it is scientific. Using them with a combination of other oils is just so incredibly powerful.” She claimed the research backing up her beliefs was “phenomenal”. I have to disagree. The DoTERRA website includes a Bibliography section. It certainly contains a long list of referencesB, many in mainstream science journals, and many others published in what one might call ‘alt.med.’ journals. I looked at the abstracts for a random sample of titles & found that they were largely reports of chemical assays (common in bioprospecting for potential pharmaceutical drugs) and in vitro tests using cell lines from mice or from human cancer cell lineages. Some included tests in rats or mice; and while some papers do appear to describe clinical trials of essential oils; it’s notable that none of them were clinical trials in an oncology context. Thus, ‘phenomenal’ is not the word I’d have chosen. The whole “it cures cancer” claim from that particular marketer is actually a very sizable red flag (along with the lack of evidence). Cancer is not a single disease, but a large number of separate disorders, each with their own underlying genomic changes. It’s thus highly improbable that a single substance (in this case, a particular essential oil) would be curative against a range of cancers. Even where testing appears to show some measure of success in an in vitro context, this is not a guarantee of in vivo success. Lots of things kill cells in vitro: essential oils (which can be quite cytotoxic), heat, cold, diluting the growth media, bleach… Which is where actual clinical testing comes in. At which point, I’ll get in ahead of the inevitable comment that ‘Big Pharma can’t patent natural cures because there’s no money in it’, by pointing out that the home company had an annual revenue of US$1.2 billion in 2016. I’m fairly sure that could help pay for a properly double-blinded clinical trial (or two) that tested an essential oil against the current gold-standard treatment for a given cancer. How about it, guys? B In a post over at Science-Based Medicine, Harriet Hall includes a list of questions that should be kept in mind with reading studies like these; it’s worth reading. And it’s a pity that the Stuff journalist didn’t ask any of those questions before writing their story.